As much as I get around the Lower Mainland, specifically for eats, there are still areas I don't frequent. One particular place is White Rock. No, there are no fears of bad drivers nor bad eats. Rather, it is just plain too far from where I live. I envy those who live nearby, there are many restaurants to choose from on Marine Drive. Speaking of which, one of my colleagues happens to live in the area and frequents many of those establishments. 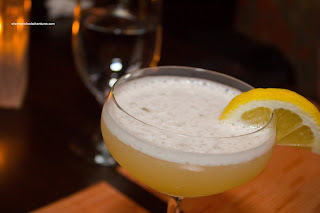 On many occasions, he has mentioned Pearl Urban Bistro. At first, he was not that impressed, but according to him, it has significantly improved. Coincidentally, the owne r of Pearl Urban Bistro contacted me recently about the possibility paying the place a visit. So with Viv and I having to be out in those parts anyways, we figured might as well kill 2 birds with one stone. We were greeted by the manager, Gina, who gave us the option of either ordering from the menu or dine on the chef's choices. We chose the latter and were presented with an amuse bouche to start. 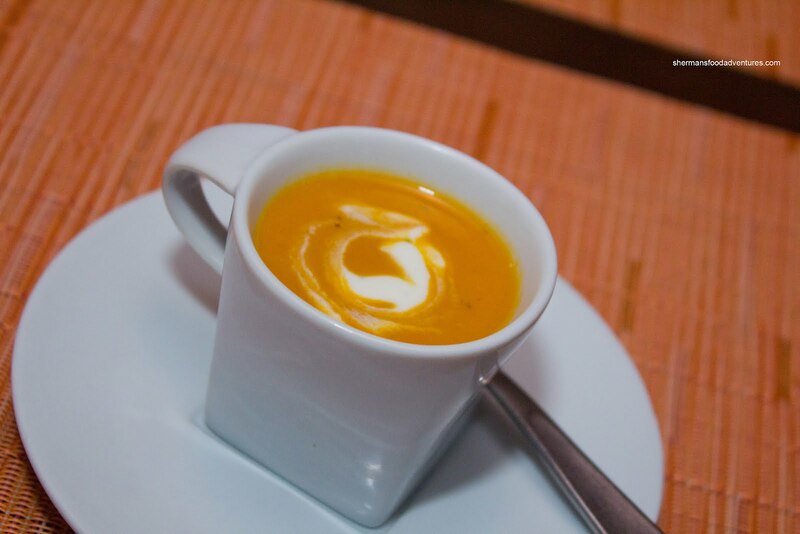 Served in an espresso cup, the Roasted Carrot & Brie Soup with creme fraiche was aesthetically appealing and steaming hot. We sampled the smooth puree and it was texturally pleasing and exhibited only a mild amount of cheesiness (mind you brie isn't exactly that flavourful though). We got a hint of tomato (possibly tomato paste) and a good amount of natural carrot sweetness. I think if there was a touch more salt, it would've heightened the flavours even more so. We were presented with our appetizers next consisting of the Crab Spring Rolls and Flamed Prawns. 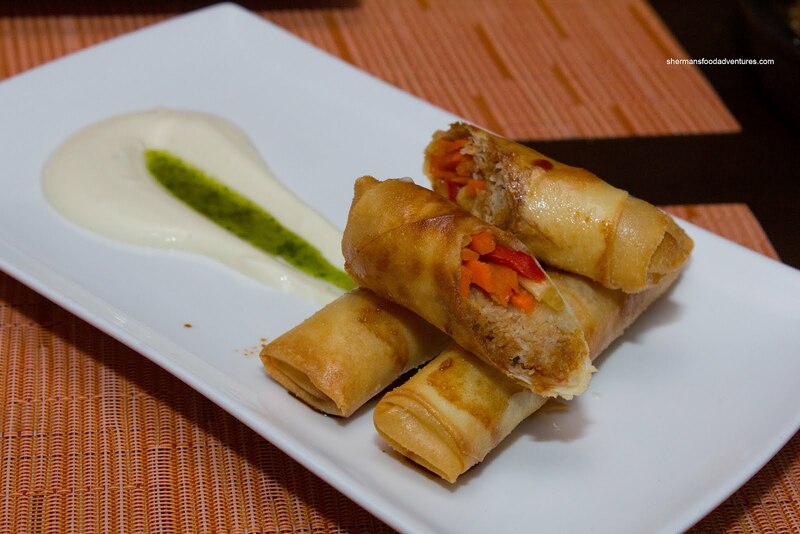 The Crab Spring Rolls came plated with a cut roll resting precariously on top of 2 uncut rolls. This was a real challenge for our server since it was a tough balancing act. Within the crispy wrapper, there was rock crab meat, fennel, red pepper and carrot. A streak of lemon garlic aioli and salsa verde completed the plate. These were pretty good with the crunch of the veggies complimenting the texture of the fluffy crab. We enjoyed the flavourful aioli, yet didn't get much out of the salsa verde. 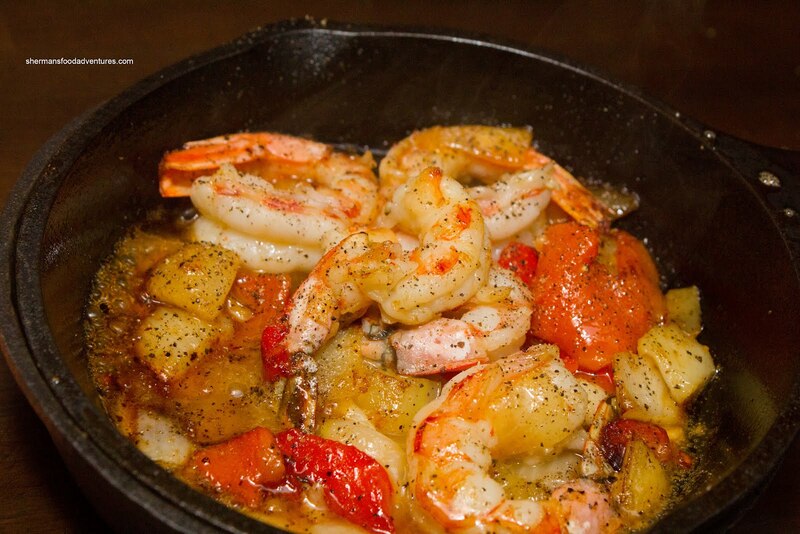 Our second appie was the Flamed Prawns presented in a sizzling cast iron pan which was lit on fire (with the help of sambuca) tableside. Although we were impressed with the presentation, the actual dish itself could've been less sweet. The roasted garlic butter sauce was somewhat muted due to the sugar content. Now that's not to say the dish was bad per se. C'mon, there are prawns at play here! I loved the red peppers, which went really well with the sweet prawns. For our main, Viv and I had the same dish being the Pemberton Striploin with Morel Risotto topped with a demi-glace accompanied by beets, carrots and kale. As you can see, the steak was thick and cooked to a medium-rare. Furthermore, the steak was cooked evenly and was super tender. There was a good char on the exterior and it was obvious the steak had rested properly (no juices flowing out when cut). As for the risotto underneath, it was a pretty good attempt, considering Pearl is not an Italian restaurant. The rice still had a bite (a touch more cooked than I personally like it though) and it was creamy and cheesy. Loved the morels, they added another layer of texture and flavour. For dessert, we were presented with the 2 selections. 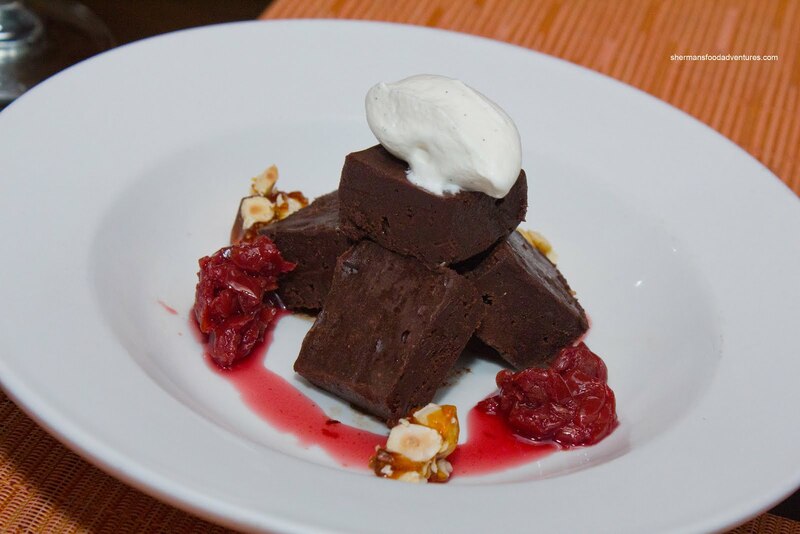 The Chocolate Pate was accompanied by mascerated cherries, hazelnut praline a nd creme fraiche. The pate was smooth with some sugar granules. I'm not sure if this was intentional or not, but I didn't mind it since it added some texture. Flavourwise, it was sure chocolaty and sweet. The tart cherries were necessary to cut the heaviness of the dessert. 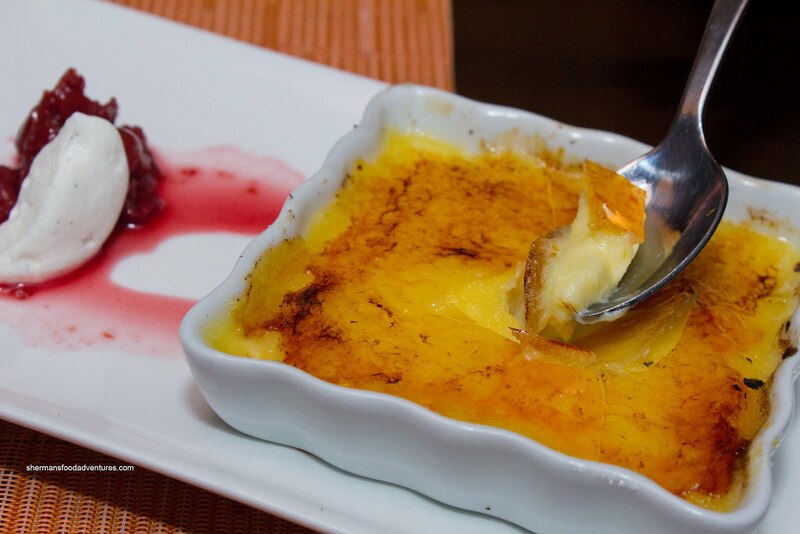 Lastly, we had the Vanilla Creme Brulee which had a relatively thick torched sugar topping. As such, the dessert was quite sweet. When we only sampled the custard underneath, it was actually not that sweet by itself. The real vanilla bean added a nice flavour. Alright, I have to admit that these invited dinners are somewhat of a catch-22 for me. If I am too enthusiastic, it would appear I've been "bought". On the other hand, if I am too critical, it might seem like I'm "reaching" for negatives to look legit. So there is never a way I can win. Hence, the only thing going for me in these cases is the body of work on this blog. 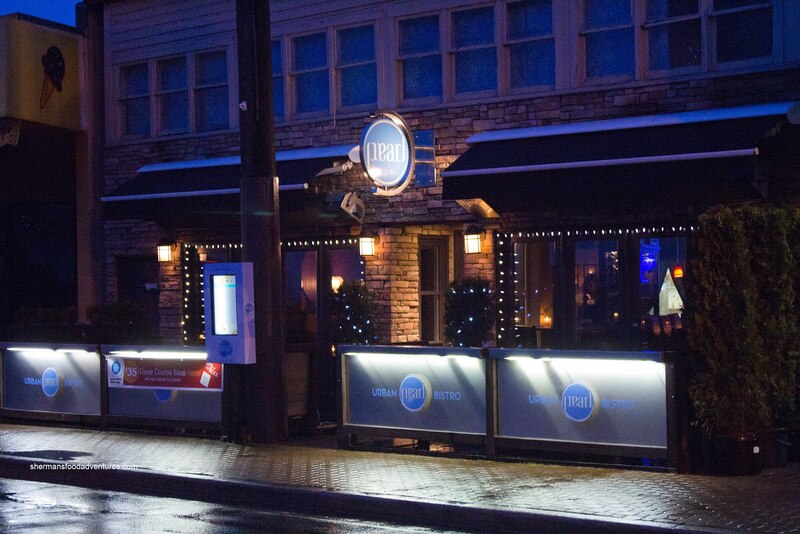 What I am going to say about Pearl Urban Bistro is that the food as a whole was decent. It is a better option than many of the chain restaurants out there. 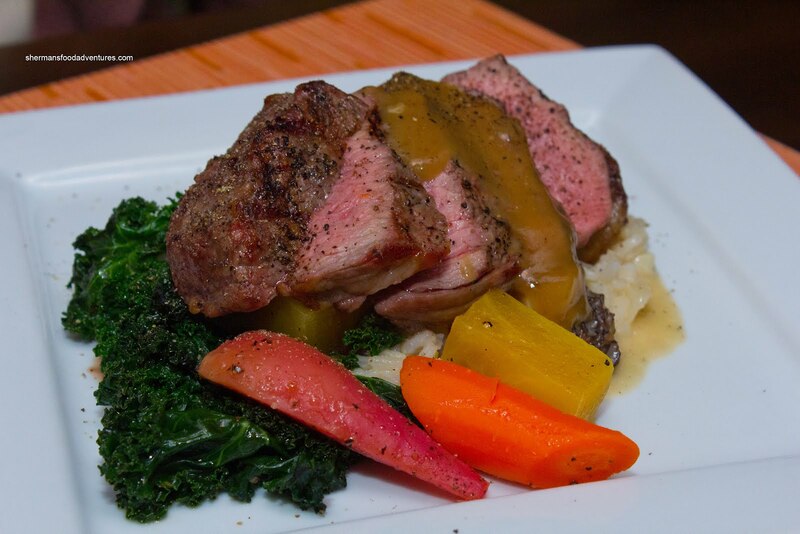 As much as there were good components to each dish, there also could be some more refinement as well. I can't comment on the service since they knew we were there. However, I did like the decor and ambiance. Very cozy and classy.